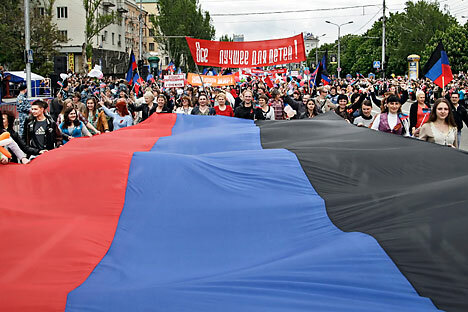 Local citizens carry a giant flag of the self-proclaimed Donetsk People's Republic (DNR or DPR) during their march marking the first anniversary of the referendum in downtown Donetsk, 11 May 2015. East Ukraine’s Donetsk and Luhansk “people’s republics” decision to go ahead with local elections on dates that contravene the Minsk peace agreements has placed the future of the entire region in question. Analysts said holding elections in the regions could lead to a freezing of the conflict and extension of sanctions against Russia. Talks to try and resolve the 18-month-old conflict between government forces and pro-Russia rebels in eastern Ukraine will face their toughest challenge in October. The test of elections threatens the very survival of agreements signed in Minsk in February on how to reach a political settlement of the crisis. The problem has arisen because heads of self-proclaimed ‘republics’ in south-eastern Ukraine have issued notice to conduct local elections in areas under their control on specific dates, regardless of the vote in the rest of Ukraine. Leaders of the breakaway Luhansk and Donetsk “people's republics” (DNR and LNR) in eastern Ukraine’s Donbass region signed decrees to hold local elections on October 18 and November 1 respectively, while the rest of the country goes to the polls on October 25. Organizing elections in the rebel-held region is a key aspect of the Minsk agreements, which stipulate that elections in Donbass must be held on the same day as those in Kiev and elsewhere in Ukraine. However, while elections must be held in accordance with Ukrainian laws, the Minsk agreements also call for ballots to be held under provisions of a special law on the special status for the Donbass, as part of the federalization of Ukraine. They also call for dialogue between Kiev and the breakaway regions, which has so far not happened. Yet Kiev proclaims that the law on a special status for the Donbass region, which has already been approved by Ukrainian President Petro Poroshenko, will not come into force before the elections, as the Minsk agreements outline, but only after they are held. This does not suit representatives of DNR and LNR, which effectively have no place in Kiev's scheme of functioning. The DNR and LNR, meanwhile, claim that organization of the elections does not violate the Minsk ceasefire agreements. According to Russian news daily RBK, they insist on the sequence of political steps reflected in the Minsk agreements; authorization and adoption of a new electoral law by Kiev, entry into force of the law on the special status for the Donbass, constitutional reform and amnesty. This is the platform on which they are willing to discuss the possibility of a compromise: holding elections in such a way so as to also meet the position of Kiev. Commenting on the decision of the heads of the DNR and LNR, Poroshenko called for strengthening sanctions against Russia, which officially denies providing the two republics with military support despite mounting evidence. Poroshenko compared the upcoming vote to elections for the heads of the republics on November 2, 2014, which he views as the reason for escalation of fighting then and failure of the first (September 2014) Minsk agreements. Speaking about the importance of the elections, Alexander Zakharchenko, the head of the DNR, said that "they are important for the state in general." "...With these elections, we conclude the construction phase of the state itself. This is the stone that we laid in the foundation, and now we will build the walls and roof. After holding the elections, we will show that we are an accomplished, self-sufficient state," said Zakharchenko, stressing that the elections will be fair and democratic, with the invitation of observers. Despite the announcement of the election dates, experts believe that a compromise between the Donbass and Kiev on the issue is still possible. In their view, much depends on the upcoming meeting in Paris between the leaders of Russia, Germany, France and Ukraine, to be held on Oct. 2. However, failure to make headway on the issue in recent negotiations does not bode well, and Russia could find itself facing further sanctions unless it can convince the leadership of the DNR and LNR to back down and follow the election procedure set out in the Minsk agreements. According to Ukrainian political analyst Vadim Karasyov, director of the Ukrainian Institute of Global Strategies, a "hypothetical possibility to ensure that these elections are held under Ukrainian legislation" still remains. He also ties this to the meeting of Oct. 2. Otherwise, he predicts a repeat of the "Transnistrian scenario" – a reference to the breakaway sliver of Moldova where, in the absence of a political solution between ethnic Russians and the authorities in the Moldovan capital Chisinau, an unrecognized state entity has existed de facto for more than 20 years. "If the elections are held on their own, the Minsk agreements will be torn down, and the conflict will be frozen," said Karasyov. "What does the failure of the Minsk agreements mean? It means the extension of economic sanctions [of the Western countries against Russia] in late January, Ukraine will not get back control of the border, while a notional border will be drawn along the line of contact. In general, everything will be modeled after Transnistria," he said. According to Andrei Suzdaltsev, Deputy Dean of the Faculty of World Economy and International Affairs of the Higher School of Economics, the elections are the "subject of bargaining” given the importance of this issue for Kiev as well as claims that the vote could lead to new sanctions against Russia. If agreement is not reached on the election, it could lead to a long-term freezing of the conflict as in Transnistria and, he claims, a withdrawal of troops. However, even if this does not happen, a resumption of hostilities is unlikely, he said, as an "escalation of the conflict will cause great harm to both Ukraine and Russia."